In surprisingly candid remarks Rouhani had said that “Standing against public demands is against the law and religion.” He had also criticized the absence of independent media in the country, lambasting the state controlled outlests. 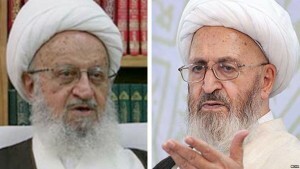 But during the week two influential religious leaders attacked the president to remind him to be careful when he speaks about the tenets of the Islamic Republic. “You are the President of the Islamic Republic, not the President of a democratic secular system,” the 91-year-old ayatollah admonished. He also said that if Iran has become a regional power, that is because of its Islamic system. Meanwhile, another Qom based Ayatollah, Jafar Sobhani, similarly rebuked Rouhani for his comments. “We leave politics and economics to you, so you should leave religious rulings for the seminary,” said the 89-year-old religious leader. President Rouhani has issued a statement insisting that his comments were taken out of context. The government’s official news agency (IRNA) published a long essay in Rouhani’s defense, describing him as a person who ardently cares about matters of religious faith and subjects deemed sensitive by Iran’s grand ayatollahs. But the fact is that on a few occasions Rouhani has challenged some of the fundamental principles of the Islamic Republic’s ruling system or indirectly the Supreme Leader himself, but his remarks on January 21 can still be considered an unexpected move.